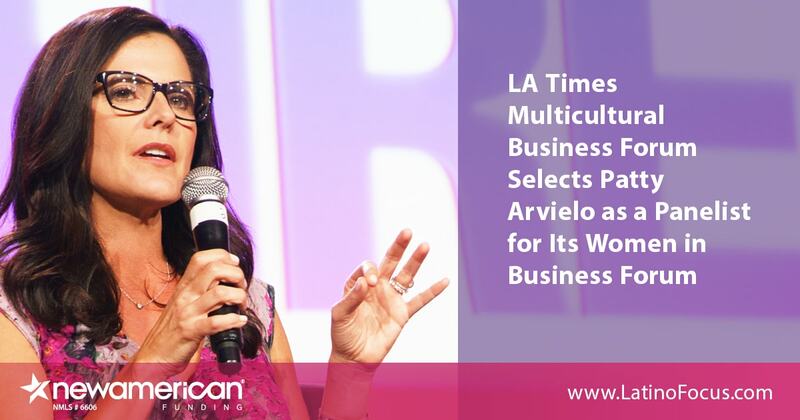 Los Angeles Times Multicultural Business Forum has selected New American Funding President and Co-Founder, Patty Arvielo as a panelist at its Women in Business Forum. The Multicultural Business Forum is designed to provide attendees with free business counseling, advice, and information on starting, improving, or expanding a small business. "I'm grateful to be in a position where I can inspire and educate other career women. The harder I work, the more of my dreams come true," said Arvielo. "And I feel honored to share my perspective in a manner intended to benefit other businesswomen. Unity among women is paramount to our success." Arvielo manages sales and operations for the company’s headquarters, branches, and 2,400 employees. She also impacts the community through initiatives such as Latino Focus Committee, which she spearheads as an avenue to educate Hispanic consumers pursuing homeownership. Arvielo is a member of the Corporate Board of Governors for the National Association of Hispanic Real Estate Professionals, and MBA's Consumer Affairs Advisory Council and Diversity and Inclusion Committee. Arvielo has been recognized for being an influential business owner by Ernst & Young as Entrepreneur of the Year for Orange County, an Elite Woman in Mortgage by MPA, and as the 2016 Business Award winner by LA Times Latinos de Hoy. Arvielo will speak to attendees at the Women in Business Forum on March 8, in Los Angeles, California.